Following the recent major discoveries in West Africa, a new focus has been placed on the conjugate margin in northern Brazil, where over the entire 2,200 km margin only 20 wells have been drilled in water depths greater than 500m. Using the analogy from equatorial African discoveries, it appears that the highest potential may be in the deep waters on the slope and continental rise of the Brazilian margin. ION’s Greater BrasilSPAN™ data is being used to identify and map new plays similar to those currently being drilled on the African margin. A GPlates* reconstruction for Africa and Brazil at 100 Ma (Late Albian/Cenomanian). Progressive opening of the Atlantic began in the south-east in the Aptian and continued to the north-west until full oceanic circulation was established by the end of the Turonian. *http://www.gplates.org/ As the Equatorial Atlantic opened, major oceanic fracture zones, ranging from the Chain Fracture Zone (FZ) in the south to the Monrovia FZ in the north, controlled the synrift tectonics of the basins on both sides of the Atlantic. These fracture zones were established at the time of initial separation along zones of crustal weakness in the original western Gondwana continent, and played a significant role as tectonic barriers for the sedimentary evolution of the basins. Oceanic circulation in the early basins was highly restricted, a setting conducive to the deposition of the source rocks which are now known to have generated the hydrocarbons in the major accumulations in Ghana and Sierra Leone. The traps in these African discoveries are structural/stratigraphic and the reservoirs consist mostly of deep-water turbidites. 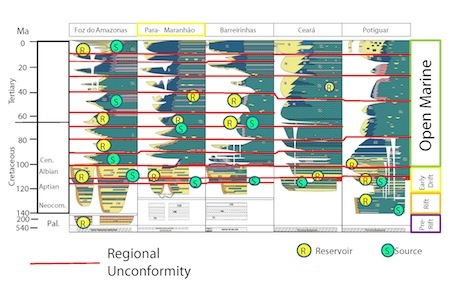 A regional correlation chart of the stratigraphy of the northern Brazilian basins. 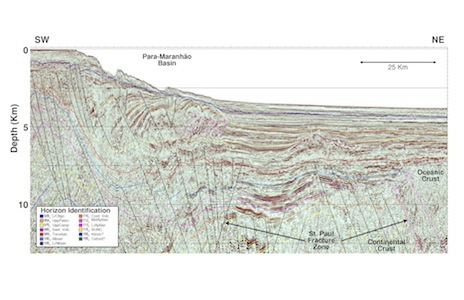 The foldout line is an example of the stratigraphy and structure seen in the shelf to deep basin of the Para-Maranhão Basin. Equivalent sedimentary sequences can be seen in all the basins from the Foz do Amazonas to the Potiguar. Thick red lines show regional unconformities that can be traced across the basins. Either producing fields or noncommercial hydrocarbon accumulations have been discovered in each of these basins, but so far almost all the drilling has been carried out in water depths of less than 500m. The tectonic history of the area, as exemplified by Line GB1-4500, the long regional seismic line shown on the preceding pages, is complex because the fault and subsidence pattern suggests multiple unsuccessful attempts to break the thick cratons. The first attempt documented in the sedimentary section was in the Late Jurassic (~155 Ma), followed by a second in the Valanginian (~140 Ma). The successful separation, between 115 and 105 Ma, progressed along a series of continental strike-slip faults that were the initiation points for the major oceanic fracture zones. Mapping from the BrasilSPAN project suggests that the separation initiated in the south and progressed northwestwards: Chain FZ at ~105 Ma, Romanche FZ at ~100 Ma, and St. Paul FZ at ~ 95 Ma. Horizons 5-12 km below the shelf in the south-west end of the foldout line are thought to be sediments within a Jurassic sag basin. Reflectors with a similar character have been drilled in eastern Brazil offshore from the Recôncavo Basin. Jurassic-age reflectors have also been interpreted to underlie the Ceará Rise at the northeast end of the line. Thick crust (> 25 Km), defined on the foldout line by the seismic character change at the Moho (purple) appears to be an important component in the preservation of the Jurassic sediments. In the Santos and Campos Basins to the south, the rich Lagoa Feia source rocks were deposited in the Valanginian sag basin overlying a failed rift. Likewise, in eastern Brazil in the narrow offshore basins north of the offshore Recôncavo, Valanginian-age sediments have been interpreted in sag basins along the edges of the thick cratons. Similar Valanginian sag basins have been interpreted from the BrasilSPAN data in the Potiguar and Paiuí-Ceará Basins, although no sediments of Valanginian age have been observed on data from north of the Romanche Fracture Zone. The progressive opening of theSouth Atlantic that began in the Barremian (130 to 125 Ma) appears to have utilized the continental strike slip faults of the north Brazilian margin. These faults would have been active at the same time as the faults that are part of the Central African Shear Zone. In Central Africa, large pull-apart basins developed in the Aptian and Albian, including the Benue Basin in Nigeria, and the producing Doba and Doseo Basins in Chad. 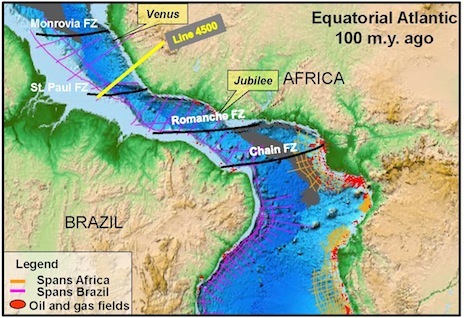 The presence of Aptian and Albian source rocks in Central Africa, and the recent Jubilee (Ghana) and Venus (Sierra Leone) discoveries provide good support for a similar petroleum system along the Brazilian equatorial margin. 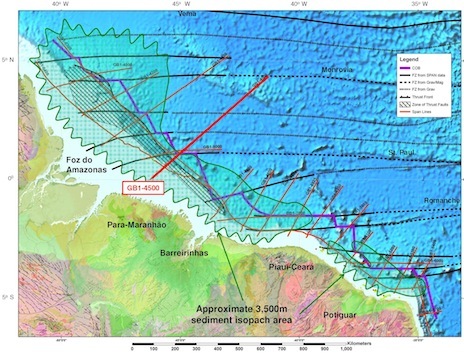 Similarly, thick sections of Aptian and Albian sediments have been interpreted along the Brazilian equatorial margin, predominantly north of the Chain FZ, with the thickest accumulation north of the Romanche FZ. Following the separation of the continents, a steep continental slope developed, as is typical for transform margins. South of the Romanche FZ, Late Aptian and Albian sediments rapidly transgressed onto the newly formed oceanic crust. North of the Romanche, where slopes were steeper, up-dip extensional faulting resulted in down-dip compression and thrusting. The age of the extensional and compressional faulting becomes progressively younger to the north-west, with recent faulting in the Foz do Amazonas deforming the sea floor. Line GB1-4500 is midway along this thrust trend and, as can be seen, the Paleocene is thrusted with deformation continuing through the Lower Oligocene. There is also a period of igneous activity that has been estimated to be of Santonian age. It is only seen overlying the oceanic fracture zones and is probably the result of a ‘leaky’ Fracture Zone. The detachment for the thrusting appears to be in the high-stand shales of Upper Campanian age (75 Ma). The gravitational flows were likely triggered by the influx of sediments associated with the Maastrichtian through Paleocene low stand. South-western end of foldout line GB1-4500, expanded so that thrust structures and the tectonic control exerted by the St. Paul FZ can been seen. The dominant fault type is strike slip, forming pop-up structures and pull-apart basins through the Campanian (075_UppCamp, lt. yellow). There is also an older period of igneous activity that has been estimated as Santonian (085_Sant. Volc. ; deep violet). The line clearly shows possible traps in thrust structures as well as in the sub-thrust, in features here interpreted to be in Turonian and younger rocks. Image: ION Geophysical Source rocks exist in all the basins in the Aptian/Albian interval, as well as in the Cenomanian and Upper Cretaceous/Lower Tertiary sequences in some of the basins. Sand-rich potential reservoir intervals as well as outer shelf carbonates are also present in the each of the basins. Opportunities for stratigraphic traps on the outer shelf and upper slope are abundant, while structures related to the gravitational extension updip and compression farther downdip are also prevalent in at least half the length along the shelf margin. With the successes from the African margin in mind, explorationists need to set their sights now on the Brazilian equatorial margin. The recent successful Blakeney discovery in UK Q21 improves the potential for more successful discoveries on the West Central Shelf. As part of the ongoing effort to discover the remaining oil reserves in the North Sea, a broadband seismic dataset was recently acquired by CGG in the West Central Graben Margin area.